I’m an IgNobel Prize Winner: Get Me Out Of Here! 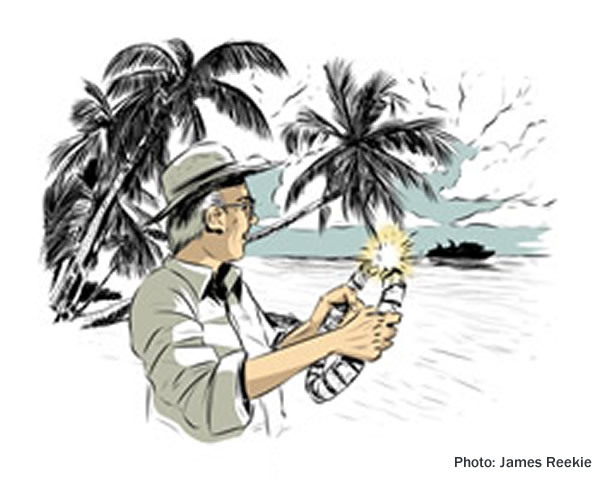 How would you use science to help you escape from a desert island? My solution, which began with using loose change to make a battery, was illustrator James Reekie’s personal favourite. If I were marooned with a group of others, I would set up a small business – corralling the island’s supply of coconut crabs, for example, and hiring them out to open people’s coconuts. As soon as the business started to turn a profit, an official from the Inland Revenue would be bound to turn up with a tax demand. It would be a simple matter to overpower this official and use his or her mobile phone to call for help. If this strategy failed, or if I were on my own, I would turn to science. Here I would hope to have a pocketful of silver and copper coins, together with a piece of flexible plastic tubing just wide enough to hold them. I would fill the tube with alternating copper and silver coins, with the coins being separated by seawater-dampened coconut fibre to produce a primitive Voltaic pile. By bending the tube around so that the opposite ends could touch, I could produce a series of small sparks. The sparks could be used to set fire to some dry coconut fibre, whose flame I would use to start a larger fire that I would keep burning continuously as a beacon. They would also generate weak radio signals for an SOS, although the range would probably be too short unless the pile was used to drive the spark coil from a model T Ford – an unlikely find on a desert island. My efforts to attract attention would include a huge “help” sign carved into the ground and filled with glistening salt from evaporated seawater. I would also catch fish with a net of woven coconut fibres. After enjoying a hearty fish meal (and not forgetting to eat the eyeballs as a source of fresh water), I would boil down the skin and bones to make fish glue, and use this to stick the remaining silver coins on to a thin flat piece of rock that I could use as a mirror to reflect the sun’s rays towards a passing ship or aeroplane. I still think, though, that the best bet would be to attract the attention of the tax authorities. This is what happened to the Swedish pop group Abba when they bought a remote island, and I offer the “Abba island effect” as my ultimate solution for escaping from a desert island.